Ces Oreña-Drilon has spoken up about the libel case filed against her by her ABS-CBN News colleague Gretchen Fullido. In a statement posted on her Twitter account Saturday, the Kapamilya broadcaster said that it is "unthinkable" for her to say what Fullido alleges she did given that she herself had been a victim of sexual harassment. "It pains me to have to issue this statement because women support each other especially in an issue like sexual harassment. "Throughout my life, I have been an advocate of women's rights and women's empowerment. As a victim of sexual harassment once before, it is unthinkable for me to say what Gretchen Fullido alleges I did. "I encourage and support women to exercise their right to come out with truthful stories of harassment and abuse and I would never belittle any such move. "I was asked to testify in an internal confidential investigation into Gretchen's allegations and some of what I said during the investigation has been distorted. "I reserve the right to consider legal proceedings against these false allegation and attack on my reputation. Again I would never belittle any woman coming out to speak of any abuse committed against her. It is against everything I stand for as a woman." Fullido on Friday filed criminal cases against a number of her colleagues at the Kapamilya news division. In a news release by Marvin B. Aceron of APV Law, Fullido filed a sexual harassment case against former TV Patrol supervising producer Cheryl C. Favila and segment producer Maricar P. Asprec, alleging that the two "sent her text messages that were loaded with sexual innuendos, which amounted to requests for sexual favors." 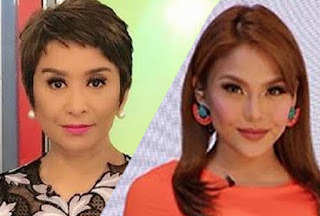 Aside from Oreña-Drillon, the Star Patroller also filed libel cases against ABS-CBN news executive Venancio Borromeo and reporter Marie Lozano, alleging that they "besmirched her reputation when they stated that she filed a similar sexual harassment complaint against Favila and Asprec with ABS-CBN management to leverage her employment status with ABS-CBN." In her complaint affidavit, Fullido also said that Oreña-Drilon "resorted to victim shaming and imputed statements that Fullido deserved to be harassed, since Fullido allegedly, was willing to wear a bikini with an inflatable pool with bubbles to shove up the ratings of TV Patrol." In a statement Friday, ABS-CBN said that it respects Fullido's right to bring her sexual harassment complaint to the court. "ABS-CBN takes sexual harassment seriously and does not condone such acts in the workplace or by its employees. When Ms. Fullido filed an administrative case against a supervising producer and a segment producer for alleged sexual harassment in November 2017, the company took prompt action on the administrative complaint and decided based on the evidence presented," the network said.